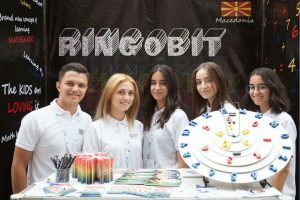 The competition of student companies is a one-day event where students from secondary schools in Macedonia together with their mentor teachers present their mini companies at one of the stands. 11 student companies from 10 high schools from all over Macedonia have participated at the Competition. 55 high school students and their mentor teachers from Bitola, Gevgelija, Kavadarci, Kumanovo, Skopje, Valandovo and Veles took direct participation, while over 30 of their classmates followed the competition. The students had the opportunity to present their companies, the knowledge they acquired throughout the process of forming and developing the company as well as preparing the company’s report and business plan. The student company “Unica Spera” from Veles from secondary school “Jovche Teslichkov” (Simona Andovska, Martina Stojkova, Sara Gorgievska, Anastasija Andovska i Arijan Amzi) won the first place at the national competition in student companies. The students offered a product containing numbers and mathematical operations aimed at acquiring and improving mathematical skills. Ringobit is a rotating, eco-friendly product offering a method of education that will have a significant impact on children’s mathematical education, reducing the learning difficulties of children with special needs, children of pre-school and school age. The colors of the numbers, red, yellow and blue, are selected for easier user recognition, while the 3D format will allow touch recognition. Second place won the student company “Find and Buy” from the high school “SOU” Josif Josifovski “from Gevgelija with their computer application for internet sale. The third place went to students from the high school “Georgi Dimitrov”, from Skopje titled “Lumens”. Lumens plans to manufacture and sell toys for visually impaired people. Students from the company Unica spera are going to represent Macedonia in the European finals that’s going to take place in Belgrade, Serbia from 16th to 19th of July.